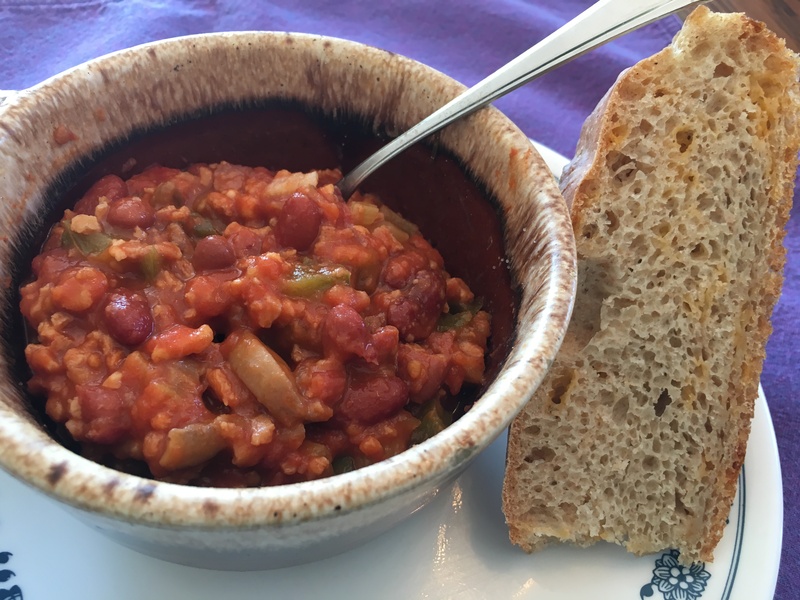 There’s hardly anything better on a cold winter day than a bowl of chili and some freshly baked bread, and I’m not the only one who thinks that is a good idea. On Tuesday, perhaps our coldest day of the winter (-33 degrees) until today (-35), I made some chili and Therese baked some no-knead cheesy bread. After we finished eating our evening meal, I saw that a friend of mine, John Reitmeier, of rural Crookston, Minn., had posted a photo on Facebook of some chili and cornbread that he made for supper. I’ve known John for many years and have followed him on Facebook regularly for 10 or so years. He’s always posting photos, and sometimes recipes, of some pretty tasty-looking meals. The latest falls into that category. The chili that I threw together Tuesday had very little meat, having just a couple of slices of diced bacon that I sautéed with onion, garlic, celery and mushrooms before adding the remaining ingredients, which included textured vegetable protein (soy). The TVP is a nice substitute for ground burger. With the temperatures not really warming up too much until Saturday, perhaps a nice pot of chili should be on your menu radar. In a large bowl, mix the warm water with yeast. Set aside. Generously oil a 10-inch skillet, including the sides. Use a spatula to loosen the dough from the sides of the bowl and transfer the dough to the skillet. Use the spatula to even out the dough so that it fills the skillet. Cover the skillet with a kitchen towel, and set it aside to rise for another 30 minutes. Preheat your oven to 425 degrees. Bake the bread for 35 minutes, or until the top is golden brown. Let the bread cool in the skillet for 10 minutes, then carefully remove it from the skillet and allow it to cool fully on a cutting board before slicing.